An scent you can fall in love with. Aquarius incense made just for your unique personality! The sign of Aquarius means you were born between January 20th and February 18th under the sign of the water bearer, and with the element of air you are smart and curious. You use your mind at every opportunity. Uranus also gives you the power of quick and easy transformation. You are philanthropic; a healer who wants to make the world better, and you do! You enjoy to doing good and helping others. You make a great team member. You are ruled by the planet Uranus, the planet of freedom and revolutionary vision, the urge for change and the ability to visualize new possibilities. You are ruled by your ankles and circulatory system. Aquarians can be a little nervous at times; your body cannot keep up with your active mind. Your ankles are the joint that connects your entire upper body to your feet, which connect your body to the earth, keeping you grounded. Your Aquarius scent is our very own Oceanic Musk to match your intentions to improve the world. This scent is yours alone and will excite your natural helpful self! You are friendly which makes people open up to you. This warm trait helps your humanitarian causes. You are known to be spontaneous, loyal and honest making you a great partner and friend. Because you are independent and can be less emotional then others under pressure, you can get things done more efficiently. The most compatible signs with Aquarius are generally considered to be Aries, Gemini, Libra and Sagittarius. Other people under the sign of Aquarius include: Oprah Winfrey, Michael Jordan, Virginia Woolf, Rosa Parks and Ashton Kutcher. 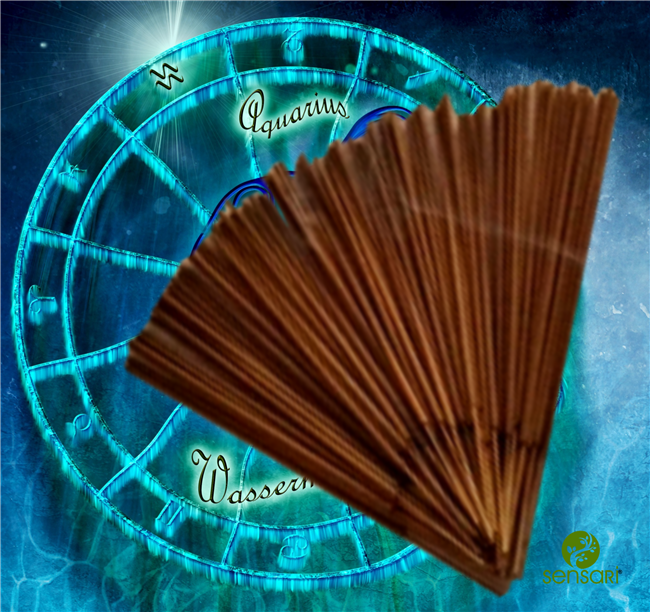 Continue your adventure with your special Aquarius incense, supporting the real you!